Metro brings modern sauna comfort and luxury to your backyard. Perfect for outdoor entertaining, Metro is at its best near the patio, pool or lake––if pool or lake side, you and your guests will be able to enjoy the ultimate experience of “sauna with a cool water plunge.” Beautiful, durable, welcoming: Metro is an ongoing invitation to enjoy your great outdoors. 4’x5′, 4’x6′, 5’x6′ and 5’x7′. The saunas come standard with Cedar runners and a vinyl subfloor allowing the homeowner to place this nearly anywhere. The roof kit is fully insulated and available with plywood (ready for your shingles), cedar shingles or metal roofing. 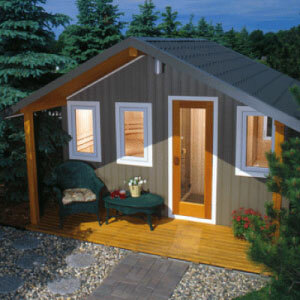 Portability, exceptional quality and easy installation make these a sauna lover’s dream. What a great complement to a pool or hot tub. Available in 4x6 and 5x7 footprints, the Finnleo Terrace sauna provides a high quality, attractive sauna built to withstand the elements at a very affordable price. With an Espresso treated Hemlock exterior, natural Hemlock interior, weatherproof polymer roof, Viki heater & SaunaLogic control and several other features, this sauna in a perfect addition to the deck or patio.